To recap on the story thus far, on the night before the Battle of Camlann, Merlyn visits Arthur one last time. Then they begin a conversation that spans Arthur’s life, from his first meeting with Merlyn as a child to his awkward wooing of Guinever as a young man. Throughout, Arthur’s concerns for the day to come — his imprisoned wife, his estranged ally, and his rebellious son — lurk in the background. There are new lessons in Wart’s education as well — Merlyn sends Wart to talk with the Badger (the wisest creature in the forest after Archimedes, according to Merlyn) to learn why humans aren’t special, and Merlyn introduces Arthur to King Pellinore in the midst of his quest for the Questing Beast to show him the folly and absurdity of chivalry and knighthood. The meeting with Pellinore and the joust with Sir Grummore Grummursum is simply wonderful — Sam Dale’s Pellinore is a doddering and adled old man, and it’s impossible not to love him immediately and completely. We also have a reminiscence about Arthur and Lancelot where the former attempts to sell the latter on the idea that there’s something more to being a knight than doing knightly deeds. These lessons all come together when, in a church courtyard, Wart finds a sword through a stone and, needing a sword for his brother Kay, he decides that he must take it. Oh, and if you’re expecting the wizard’s duel between Merlyn and Madame Mim, it’s not here. Tell me something helpful. Is Lancelot going to come to our aid? He won’t fail me again, will he? I might argue that you failed each other. Which was worse: him falling in love with your queen, or you refusing to see what was happening? It was difficult. Lance was the only one who really understood about might for right. It wasn’t the easiest concept for medieval minds. You managed to drum it into me. Of course, you do realize that most of the time I had absolutely no idea what you were talking about. I didn’t care. I simply liked hearing you talk. I never liked grown-ups who talked down to me, but you just went on talking in your usual way, leaving me to try and follow along in your wake, clutching at one or two known words, jumping at meanings. With all the glee of a young perch learning to swim. There’s genuine warmth and affection here between the two men, and Paul Ready (as Arthur) and David Warner (as Merlyn) sell their relationship. These two men feel like they have a bond that lasted a lifetime, and when Arthur expresses joys and regrets about life, they feel true. The episode is serious, hilarious, profound, and touching, sometimes all four within the span of a single minute. Arthur’s wish to become “the Black Knight” is unintentionally funny; I thought both of Arthur dismembering the Black Knight in Monty Python and the Holy Grail and Arthur dismembering the Black Knight in the medieval romance Perlesvaus. The genuine humor in the episode, though, comes through the script and the performances. And the scenes between Arthur and Merlyn, in the camp the night before Camlann, are deep and often moving. Near the beginning of “The Coming of Merlyn,” Merlyn says, almost as an aside, that he has come to Arthur to complete his training. Just as the lessons Merlyn taught the young Wart as a child prepared him to pull the sword from the anvil, one begins to suspect that life itself was a lesson for Arthur and Merlyn has come to prepare the aged and frightened Arthur to confront the end with all the surety and confidence that he had as a young boy, in a courtyard, facing a sword in a stone. 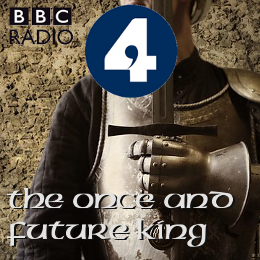 Sibley’s The Once and Future King deftly brings the Arthurian world as imagined by White to life. It remains a keeper. Great review, thanks, but don’t rule out Madam Mim JUST yet!